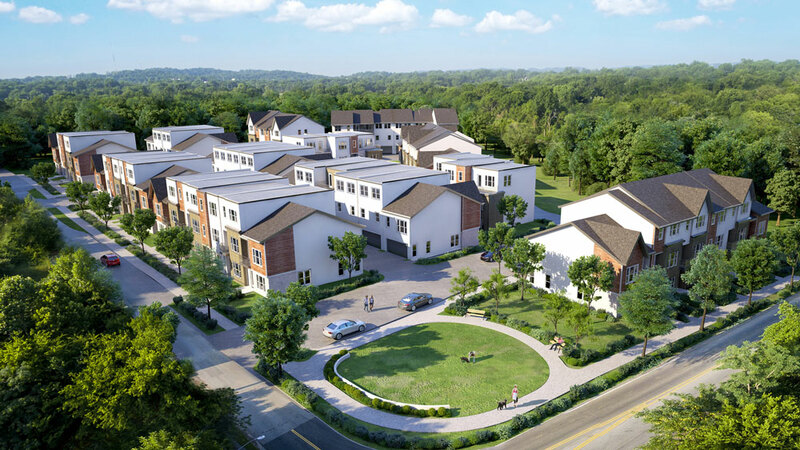 Fishbein, with partner Brian Hoffman and executive vice president Michael Larsen, opened sales on Aug. 3, for 2AVES, a $22 million luxury townhome community on a nearly four-acre site at the corner of Vernon and James Avenues near Charlotte Park. Residents are expected to begin moving in March 2019. It is one of four projects the partnership currently has planned in Nashville, and the first time they have made a commitment to build and develop several projects over several years outside Chicago. They did due diligence on various markets – three in North Carolina, a few in Texas – but Nashville ultimately won out. Less than 500 miles from Chicago and with numerous non-stop flights daily, it allows them to maintain two bases with the ability to easily travel back and forth. The more they studied the Nashville market, the more they realized urban and infill town homes would be what most suited their skill sets, while also providing Nashvillians more of what residents needed most. They formed a land development team, similar to the way they’ve done it for years in Chicago, hiring a transactional and land use attorney, civil engineer, land planning firm, architect and two commercial brokers. “There seemed to be a fair amount of land opportunities for us here,” Fishbein says. He found land-use laws and the process of zoning and development are generally similar in Nashville, and Chicago, at least in terms of the steps that have to be gone through. That process not only includes the zoning and development, but also working closely with neighbors, council persons and neighborhood groups. The surprise was the lack of an inclusionary zoning mandate that requires them to set aside a portion of their units as affordable housing. And yet, they did it anyway. After meeting with neighborhood groups before they began the project, it was clear that gentrification and rising real estate taxes were a real concern if luxury townhomes came in. “We had an old cliché from a generation ago that Red Seal likes to lock arms, not horns,” Fishbein continues. “There are usually a number of stakeholders that have a variety of interests and the most important thing a developer can do is to sit and listen to those interests very carefully. To sit and listen to the neighbors, the elected officials and really understand what their needs are. When Metro Council members Colby Sledge and Ed Kindall and their neighborhood groups expressed a desire to have workforce housing voluntarily incorporated into the Red Seal projects in their districts, Fishbein and his partner made sure to include nine units. And because they are not seeking incentives, they are free to do it. “Our job then is to go back to the drawing board and to figure out a way that we can accommodate the community’s concerns and still have a viable real estate development deal,” Fishbein says. “In both of those cases, that’s what we did. We went back and looked at creative ways to create a substantial amount of workforce housing voluntarily on all of these sites. “We are so lucky in terms of the growth that Nashville has seen,’’ says Emily Thaden, director of national policy and sector strategy for Grounded Solutions Networks, a national membership organization of nonprofits and government programs committed to developing affordable housing. She also serves on the board of commissioners for the Metropolitan Development and Housing Agency in Nashville and the advisory board for Habitat for Humanity of Greater Nashville. Metro Council inclusionary housing legislation, passed in September 2016, was meant to stimulate the development of affordable apartments. The state legislature then moved to block policies that would require developers to include affordable units, so Metro passed the incentive-based ordinance. In 2017 Rep. Glen Casada introduced a bill to block the incentive-based policy that passed in the house. The companion legislation was passed in the senate this spring. Thaden says that from the very beginning there was the interpretation that the state law banned anything that could be construed as “rent control,” so that even before it passed it expressly prohibited mandatory inclusionary housing policies. Metro attorneys and policy consultants were assuming a voluntary policy was the only option for an inclusionary zoning policy. Therefore a voluntary policy, which applied to both homeownership and rentals, was designed that offered developers the option to take incentives for producing affordable units. But the most recent state law prohibits voluntary inclusionary zoning too, so the local policy was shut down. Rendering of 2AVES (like two avenues) development at Vernon and James avenues in The Nations. 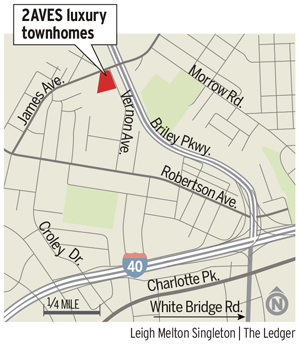 Nine of the 58 units will be set aside for workforce housing. A 2016 national survey – conducted by Thaden and Grounded Solutions and published as a working paper by the Lincoln Institute of Land Policy – addresses some gaps in knowledge on inclusionary housing policies. The survey identified 886 jurisdictions across America with inclusionary housing policies. Nashville was not one of them. The research shows developers usually have options for how to contribute to the creation of affordable housing, most often by providing on-site affordable units. This not only creates affordable housing, but it also promotes economic integration. About half of programs sampled for the survey allowed options to pay a fee in lieu of offering some on-site units or to build affordable housing in a different location. Other, less popular alternative compliance options included land donation, preservation or rehabilitation of existing housing and impact or linkage fees for commercial development. 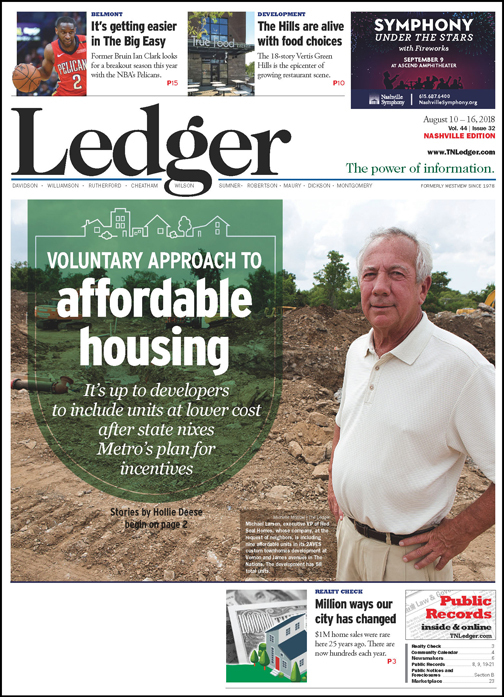 “Nashville is very behind in terms of building its toolkit for affordable housing, and part of that has come from challenges on whether it’s possible under state law,” Thaden explains. “Obviously, if we continue to see state preemptions on trying to adopt new tools, this is tying the hands of our local government. Thaden says one of the big arguments against inclusionary zoning laws is that the burden of solving the social crisis of affordable housing is placed on the shoulders of a few people within the private sector, namely private developers and land owners. But she says that is a false narrative because, fundamentally, city investments in public infrastructure, recruiting and investments build the local economy and attract developers. “The very concept behind an inclusionary housing policy is to capture some of the public value that we have already created and spent money on,” she adds. “That wasn’t done by the developer. That was done by the fact that we have been making huge public investments. Families paying more than 30 percent of their post-tax income on housing are considered cost burdened, the Department of Housing and Urban Development states, and may have difficulty affording necessities such as food, clothing, transportation and medical care. 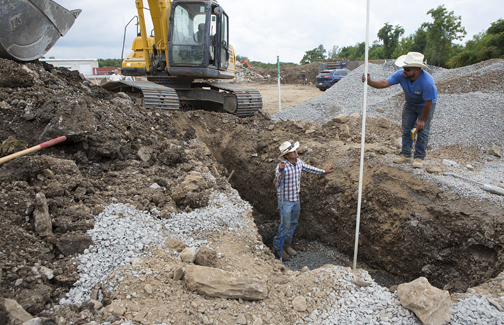 Construction workers prepare for the laying of foundations at the 2AVES custom townhomes development at Vernon and James avenues in The Nations. To alleviate more of their income going to rent than they can afford, Nashville’s working class, including teachers, first responders, nurses and city employees, are getting pushed to outlying counties. Mark Deutschmann, who founded Village Real Estate Services in 1996 and Core Development Services in 2003, is credited for his work in revitalizing Nashville’s Hillsboro Village, Germantown and 12South neighborhoods and serves as chair for the Urban Land Institute in Nashville. He says dealing with affordable housing is an issue everywhere around the world as people return to urban living. “There are two and a-half billion people moving back to cities in the next 30 years, and it seems many cities like Nashville are having issues with affordability and the workforce housing aspect of it,” Deutschmann explains. At Core Development, Deutschmann builds mixed-income projects, mostly on infill or former industrial property. For example, at Alloy on Tech Hill, he launched with 40 condos priced at less than $200,000, which is in the ‘workforce’ price range. In the same development there are other units priced up to $350,000. In Wedgewood-Houston, Core has built two projects that have a mix of workforce housing and live/work units. And his nonprofit foundation, the Village Fund, works with nonprofits like Rebuilding Nashville Together and Hands on Nashville to retrofit existing Wedgewood-Houston neighborhood homes for energy savings. “It is important to save the existing stock of affordable homes, to allow seniors to age in place, and to preserve these larger, multi-generational households,” he says. He was also an advocate of the failed transit plan and how that could have benefited the workforce in Nashville’s neighborhoods, especially along corridors like Charlotte and Nolensville. Without a good transportation system Deutschmann worries people of less means will be pushed away from the city. “We think in terms of ‘affordable living’ and understand that walkability and access to transit is important to the workforce,” he says. “Affordability, not just affordable housing, but affordable living, is recognized as something that’s associated with transit and transit stops and transit-oriented development. When you’ve got a centralized transportation, affordability can go hand in hand. He says a community will then likely lose diversity and push people of less means away from the city, so you have a sort of a suburbanization of the city that starts happening when people of less means can’t live in the city, coupled with lack of transportation, and life becomes even more expensive. Fishbein says Nashville is obviously going through tremendous growth, and there’s a recognition of that growth, and a recognition of a need to accommodate that growth in an orderly and smart way – to be a steward of that growth. The idea is to not just to allow growth to happen, but to make sure it happens in a way that makes sense based on planning principles and land use principles. And his firm wants to be a part of that conversation. Still, the company ultimately hopes to make a positive addition to the communities they develop, so that the communities, in turn, will be excited about the next time Red Seal finds a piece of land in the neighborhood to develop. “There is almost always a way to listen and to accommodate, at least in part, concerns of the neighborhood. It’s always a compromise. We’re usually giving more than we would like and the neighbors are usually not getting quite as much as they would like, but that process and that compromise is really important,” Fishbein explains. Thaden says that despite the state’s block on incentive-based programs for affordable housing in Nashville, it can’t stop developers like Red Seal from figuring out how to offer their own workforce housing programs. And since Red Seal is not beholden to certain regulations in exchange for incentives, their workforce housing units will follow three self-imposed guidelines: a maximum purchase price based on median household income, that the percentage of units in their developments at least meets what an ordinance would typically require, usually 10-20 percent, and most importantly, deed restrictions so the price of the workforce housing units only escalates a very small amount each year. “It doesn’t do much to create workforce housing only for the first buyer and not for subsequent buyers,” Fishbein points out. Deutschmann recently created a mixed-used city center development in the WeHo neighborhood, turning underutilized industrial space into a makerspace with gathering places like a coffee house and units that started at $139,000. He came up with the plan after meeting with the neighborhood and the city planners about what the neighborhood needed. But not every developer is going to volunteer workforce housing. So, the real benefit to inclusionary housing policies, Thaden says, is the fact that it effectively requires that affordable housing be placed where new construction is occurring. And new construction is typically occurring in areas that are gentrifying, or in areas that would be considered rich with opportunity, or are growing as areas rich in opportunity. “A thriving city means that people have places to live,” Thaden adds. “You can look at some of the worst-case examples, like San Francisco right now, where the housing market has gotten so extreme that the people who work in that city cannot have a home there. That’s not a healthy place.